LinkedIn is the social network for professionals and provides an excellent way of keeping in touch with work colleagues as well as finding out information about company workers. The LinkedIn iOS app provides access to a selection of options available on the main site, making it possible to keep in touch and up to date wherever you may be. The app can be used to view your list of connections as well as viewing your contacts details and status update. Connections can also be contacted through the app and their contact information can be added to your phone's address book. Management of your inbox is a little limited, but it's good enough for basic messaging on the move. LinkedIn's iOS app notifies you of invitations to connect with other and suggests other users of the service you may know based on the people you already have in your contacts. When meeting up with a contact in person, a Bluetooth connection can be used to swap contact information. Unfortunately, it is not possible to make changes to your profile through the app. - When you're in a conversation, speed and stability matter. The LinkedIn app is now more reliable than ever. This update contains bug fixes. 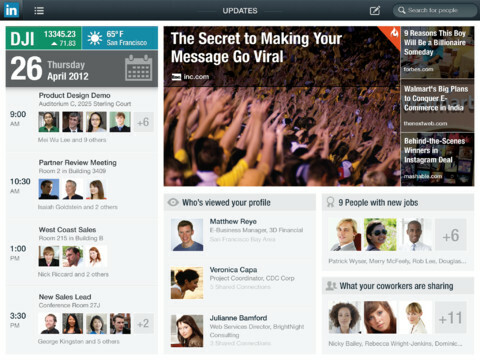 LinkedIn is a different type of social network and the iPhone app makes it easy to manage your connections while away from your computer.